The blogosphere last week once again fixated on one of its most popular topics, global warming, following a BBC interview with Phil Jones, the scientist at the center of the so-called "Climate-gate" controversy last year. Jones, the director of the British research unit whose emails were uncovered, answered detailed questions about the science behind global warming and said he was "100% confident that the climate has warmed." The response to his answers highlighted the divide between those who support the theory of global warming and those who question it. In the blogosphere from February 15-19, the global warming debate received more than a third (34%) of the week’s links according to the New Media Index produced by the Pew Research Center’s Project for Excellence in Journalism. This is the first time the subject has made the list of top five subjects among blogs since last December when global warming was a significant subject for three weeks in a row. The previous discussions of climate in the blogs were mostly dominated by the voices of global warming skeptics. This past week, that viewpoint was still the predominant one, but supporters of global warming science were more visible than in previous weeks. The subject of global warming has been of much greater interest in social media than it has been in the traditional press. 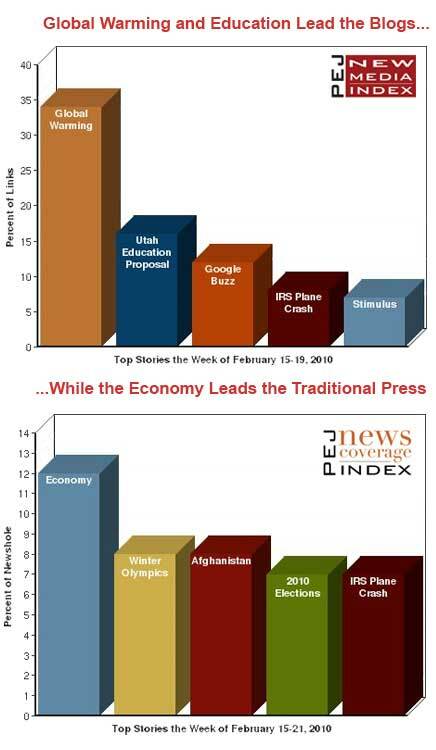 Last week, the story was not among the top ten subjects covered in the mainstream media, according to PEJ’s News Coverage Index that monitors coverage in traditional media. And for all of 2009, global warming was the 15th largest subject, receiving slightly less than 1% of the newshole for the year. The second-largest subject on the blogs last week, representing 16% of the links, was a proposal by a state senator in Utah to cut the 12th grade as a way to save money amidst a budget crisis. Most bloggers ridiculed the notion and the political motives behind it. The third-biggest story, at 12%, was the same issue that led on Twitter the previous week, Google’s new social-networking feature called Google Buzz. This past week, Google admitted to the BBC that the testing for the social network was insufficient prior to its launch. The story of the man who crashed a small plane into an IRS building in Austin, Texas as revenge against the tax agency, was fourth at 8%. And a USA Today report about $3.5 million in stimulus funds going to programs that President Obama wants to cut in his new budget was fifth with 7%. 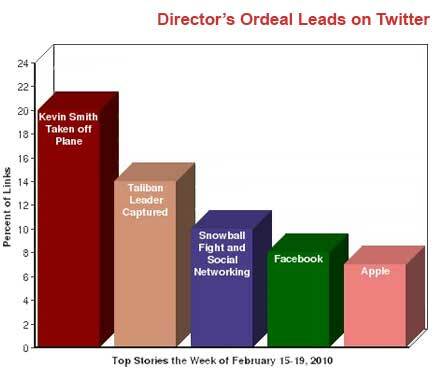 On Twitter, the subject that gained the most attention (with 20% of the links) was an unusual celebrity story. Bulky film director Kevin Smith was removed from a Southwest Airlines flight because of his size. Despite multiple apologies from the airline, Smith wrote a number of angry Tweets about the incident which created a public relations nightmare for the company. The second-biggest story, with 14%, was the capture of the Taliban’s top military leader, Mullah Abdul Ghani Baradar, in Pakistan. The next three biggest stories on Twitter were all technology-related. Third, at 10%, was a CNET News report about members of the Philadelphia City Council who were considering legal action against Facebook, Twitter, and MySpace, after a group of teenagers used the social-networking sites to organize a massive snowball fight that resulted in 16 arrests. A story about the partnership between Facebook and the eBay-owned payment system PayPal was fourth at 8% followed by several stories about Apple including the news that the company cut some staff working on its Final Cut video editing software at 7%. On the video sharing site YouTube, the most viewed event was the fatal training run which killed Georgian luger Nodar Kumaritashvili at the start of the Vancouver Olympics. Despite the fact that YouTube pulled the footage shortly after it occurred, millions of people viewed related videos including a number of commentaries on the subject posted by relatively unknown individuals using pseudonyms. Last November, emails from the Climatic Research Unit at the University of East Anglia were uncovered that global warming skeptics argued showed misleading research and poor record-keeping by one of the world’s leading research organizations. The pressure resulting from the incident was so great that the director of the unit, Dr. Phil Jones, stepped aside while the matter was investigated. Last week, Jones granted an interview with the BBC in which he answered detailed questions about climate change science, including some posed by global warming skeptics. Jones reasserted that the globe is warming and that man is at least partially responsible. But many bloggers last week seized on Jones’ statement that since 1995, there has been no statistically-significant global warming as a dramatic admission. "He [Jones] has publicly admitted that not only is global warming not caused by man, but nothing significant is happening!" announced Dan at Ordering Disorder. "But don’t take my word for it. In his interview with the BBC, he admits that since 1995 there has been no statistically significant planetary warming." "Dr. Phil Jones, disgraced climate scientist…has now admitted what many of us have been saying for years; that there hasn’t been any statistically significant warming of this planet for over a decade. We are, in point of fact, in a period of cooling," wrote Alex G. Tsakumis. "The guy is still a True Believer, but a fair reading of his interview suggests that he is quick to rationalize his way out of contradictions," added Conservatarian.net. "He admits that he was trying to hide data that he considered contrary to data he preferred to use and which, of course, supported the global warming myth." Supporters of global warming science saw the interview much differently and faulted the media’s reporting of it, most specifically the British newspaper The Daily Mail whose article about the interview led with a headline suggesting Jones had made a "u-turn" on his position. "The echo chamber is alive and well and currently bouncing Phil Jones’ bastardized quote all over the global media," asserted Emily Murgatroyd at Desmogblog.com. "The Daily Mail selects part of his response, stripping it of its context and using that selection to argue that Prof. Jones is backtracking on the likelihood of global warming." "Global warming deniers…have been all over the news that a prominent expert scientist on global warming supposedly says there has been no warming since 1995. Not surprisingly, it turns out the scientist was quoted out of context ," argued Jay Steele at Liberal Pastor in Burnsville. "This is what happens when you get your news from FOX and Drudge. Facts are fungible. Scientists are only quoted if a portion of their quote can be twisted to match a preconceived ideology." Utah Republican State Senator Chris Buttars recently proposed eliminating the 12th grade in order to help solve the state’s $700-million shortfall. Bloggers overwhelmingly disapproved of the suggestion. "Perhaps you’ve heard of the proposal in the Utah state legislature to eliminate the mandatory 12th grade," wrote Erik Loomis at Alterdestiny. "Seniors just screw around anyway, right? Also, I’m sure if that happened, senioritis wouldn’t just transfer to the 11th grade or anything. Also, large numbers of teenagers hanging around with nothing to do has never caused any problems in society or anything." "If Republicans have exhausted their search for other areas to slash…if they must now turn their gaze upon education, perhaps they should at last rethink the value of the last decade’s tax cuts for the extremely wealthy," condemned Burr Deming. While in the definite minority, there were a few who believed the proposal was worth considering. "Individual students are in the best position to know what will best meet their particular educational needs," suggested Susan Simpson at The View from LL2. "For many students, their senior or even their junior year of high school really just amounts to killing time-a period more concerned with social milestones than educational ones. Removing the bureaucratic strictures that prevent them from choosing the educational path that is a policy move that should have been adopted long before now." By far, the subject that grabbed the most interest on YouTube last week was the tragic death of Georgian luger Nodar Kumaritashvili at the beginning of the 2010 Winter Olympics in Vancouver. The video of the fatal training run that ended Kumaritashvili’s life was broadcast on NBC and several versions were posted on YouTube soon after the accident occurred. However, the International Olympic Committee asked YouTube to remove the video from its site claiming it was copyrighted material. But since the video had already been posted online and broadcasted on television, the clip remained available on hundreds of other blogs and sites beyond YouTube. And despite the fact that the video itself was removed from YouTube, millions of people viewed related clips. In fact, the top four most viewed news clips on YouTube were about the incident. Three of those clips consisted of individuals giving their own opinions about the tragedy and the media’s coverage of it. The third most viewed video was a news bulletin from Channel 11 in Australia that featured still photographs from the incident along with fast-moving text that described what happened. Note: Due to a technical error capturing the sites, stories from Monday, February 15, were not included in this week’s sample.